Old Town: Open Wed-Sun, 10:30 a.m.-6 p.m. Zoo: Open daily 10:30 a.m.-5 p.m. The wild west is still as wild as ever at Bonnie Springs Ranch. Located about 30 minutes southwest of the Las Vegas Strip, just "down a piece" from Red Rock Canyon, this 115-acre ranch is a replica of an authentic 1880’s Nevada mining town. Anyone who loves the Old West, especially those with families, will enjoy the horseback riding, reenactments, petting zoo and frontier architecture featured at Bonnie Springs. Bonnie Springs Ranch was built in 1843 as a stopover for wagon trains heading to California on the Spanish Trail. General Fremont reportedly used the area to gear up before an expedition through Death Valley in 1846. However, Bonnie Springs Ranch as we know it today was established in 1952 as a quaint out-of-the-way attraction for tourists and locals. With the Las Vegas urban area ever expanding, the ranch is no longer far from civilization. Not to worry; being located within Red Rock Canyon has helped insulate the area from too much modern encroachment. 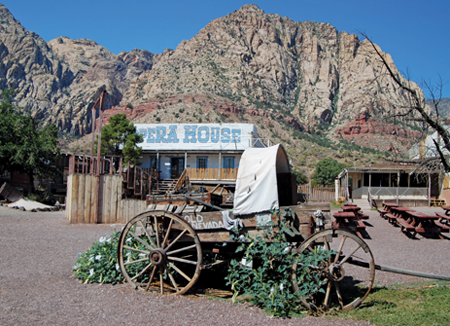 Upon entering Bonnie Springs Ranch, guests will be immediately immersed in the Old Nevada Western Town, which is open Wednesday through Sunday during the summer. The town feels like something out of a John Wayne movie, only you’ll be able to wander around the old-style bank, saloon and jailhouse. Guests can practice their skills at a shooting gallery or explore the town wax museum, which is home to an organ from the 1880, old typewriters, boots and branding irons. The gift shop offers cowboy hats and apparel, toy pistols, stuffed animals and plenty of Western memorabilia for the souvenir shopper. The “residents” of the Old Town are also famous for putting on reenactment shows in the afternoons. Guests can witness shoot-'em-up stunt shows, stage melodramas in the Opera House and even a “public hanging.” Wednesdays through Sundays, guests can see melodramas at 11:30 a.m., 2 p.m. and 4:30 p.m. and hangings at 12 p.m., 2:30 p.m. and 5 p.m. “Posse shows” are performed Saturday and Sunday at 1:30 p.m. and 4 p.m.
Bonnie Springs can be especially entertaining for children. There’s a merry-go-round outside the schoolhouse, and a miniature train offers rides around the Old Town on weekends. Perhaps the most popular attraction for kids, or the young at heart, is the non-profit petting zoo, which is open seven days a week 10:30 a.m. - 6 p.m. in the summer and 10 a.m. - 5 p.m. in the winter. The zoo allows guests to get up close to various animals, including pigs, llamas, turtles, peacocks and more. Being located within the Red Rock Canyon National Conservation Area, Bonnie Springs Ranch is popular for its riding stable and guided tours on horseback. These tours give riders a chance to experience the western landscape in all its unfettered glory. Some tours may even encounter wild mustangs. 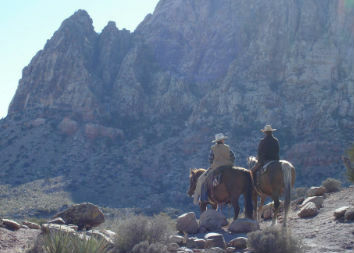 Horseback rides in Red Rock start at $60 for an hour and are offered from 9 a.m. - 5:45 p.m. (closes earlier in the winter). It’s recommended to book a reservation at least a day in advance. Since most of Bonnie Springs’ attractions are outdoors, spring and cooler summer days are the most comfortable times to enjoy the Old Town. 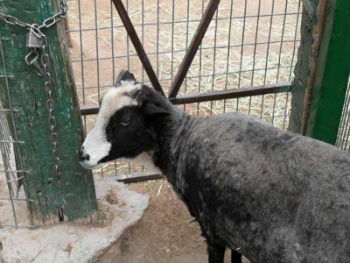 The petting zoo and horseback riding are open every day, but they close earlier in the winter. While summer days can get hot, autumn and winter evenings can be surprisingly chilly as Bonnie Springs is at a slightly higher elevation than the rest of the Las Vegas valley. One of best times to visit the ranch is in October, when it is transformed into “Bonnie Screams” and turned into a real ghost town with haunted houses and other Halloween festivities. Bonnie Springs has earned a reputation for being haunted even after the holiday. "Ghost Hunters,” the popular reality TV series, featured an episode on the ranch in 2010. 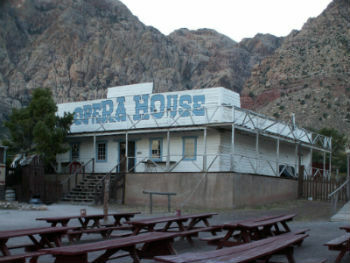 The hunters detected paranormal activity inside the buildings, including the opera house, saloon, schoolhouse and wax museum. Today, the ranch offers periodic ghost tours for those who want to explore this paranormal activity themselves. Bonnie Springs Ranch Restaurant stays open after the attractions close (Monday - Friday 9 a.m. - 9 p.m., Saturday - Sunday 8 a.m. - 10 p.m.). The rustic decor features stone floors, log beams, chairs made from tree branches and a roaring fire in winter. The menu is diverse with a selection of steak, ribs, chicken, burgers and potato skins as well as pancakes and eggs for breakfast. The ranch also has a small motel with themed rooms, fireplaces and jacuzzi tubs.